As the only local daily newspaper for the area, the Ventura County Star has quite a responsibility for getting the news and getting it right. News Director Darrin Peschka (pictured above) and Consumer Experience Director Michelle Rogers were the speakers at Rotary Ventura South's regular meeting on Monday, July 30, and they provided a fascinating profile of the 100 year-old publication and how it has adapted in recent years to the challenges of social media and the electronic era. Darrin noted that, although the print edition of the VC Star is still going strong, many readers have switched over to the electronic version (vcstar.com), viewable on desktop computers, laptops, tablets, and smartphones. 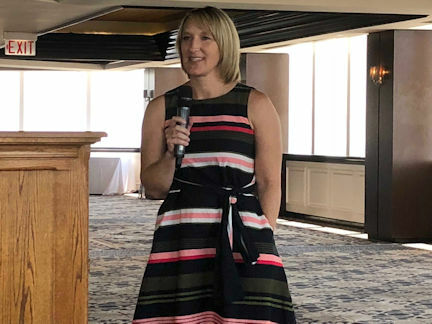 She highlighted a number of recent stories that won awards from the California News Publishers Association, including a law enforcement piece that was worked on by virtually the entire Star editorial team. Michelle provided details on the Star's extensive social media presence, noting that the paper can be followed on Facebook, Twitter, and Instagram. She also explained feature such as the "Never-30-" podcast, "Prep Period," and "Storytellers." "Staff at the Star have worked hard to create a very interactive experience for our readers," said Michelle, "and we look forward to receiving news, opinion, and other reader input daily."